European decorative glass and ceramics....Ideas on how you can easily introduce glamour to your home or office, with glass and ceramic bowls, centerpieces, vases, etc. Advice, questions, and answers on what is current and trendy in the world of home and office accessories! Glamorous Glass is your guide to your glamorous home or office. A few weeks ago we got in touch with a company called Kozzi Images and got the opportunity to have some of our products professionally photographed. The pictures are available at www.kozzi.com so check it out for more of great photographs. The Company offers free downloads of professionally taken pictures of things, landscapes, natures, pets and so on. It's a great source of wonderful photographs. Here are some examples of how you can use our glass vases and glass bowls. Pictures were taken by Kozzi Images. Tell us what you think. How many times we all were facing a problem of finding appropriate housewarming gifts for our friends and family. Buying an apartment or a house is an enormous step for them, and we want to contribute and make it an unforgettable event. We can do it with a unique housewarming gift. There’s no doubt that there is a great variety of home décor products in the market which can serve as housewarming gifts. However, only some of them are unique enough so they can stand out among other gifts of this kind. 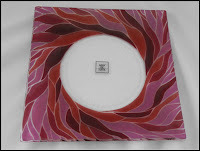 Fine glass art is a great choice when deciding on housewarming gifts. The best thing is that glass art works come in a variety of shapes, sizes, colors and functions so you will find some excellent pieces for any home decor. When it comes to centerpieces, a unique, hand-made glass piece can become a focal point of any room. A new host will be grateful for getting a high-quality blown glass vase or other centerpiece which will dress up their room or office. A glass vase is one of the ideas for housewarming gifts. You will find a huge variety of glass vases that you can choose from. However, only some of them can be called a piece of art and constitute an original way of decorating a new home. A glass vase in its best will make a statement about uniqueness of your host, so while choosing a housewarming gift, pick the one which will match personality of a new home owner. Also, bear in mind that a glass vase will not be necessarily utilized by the owner to hold flowers. Therefore, select the piece which is a decoration in itself. Glass bowls are excellent housewarming gift ideas. They can not only be a piece of home décor but also be utilized to serve food or hold small decorating items. Possibilities are endless. Hand-made glass bowls are underutilized as centerpieces. However, properly displayed, they can wonderfully complement home décor. Glass art candle holders are truly exceptional in home décor. They are loved by new home owners as they are a wonderful way of warming, often still unorganized and under decorated rooms of a new house. While picking a glass housewarming gift, the type of glass, its colour as well as size need to be taken into consideration. However, very often we do not have the knowledge of what the new house owner’s ultimate décor idea is, and what each room’s style will be. That is why it is recommended to either enquire about the colours and décor which will dominate in the rooms, or simply choose the pieces which are neutral in its colour and style, such as a beige vase or a greyish bowl. If none of these are possible, take your glass housewarming ideas a little further and simply decide on getting a dinner set. There is no doubt that a couple of hand-blown glasses or/ and fused plates will make the host happy. Also, it is easier not to make a wrong choice when picking the plates or glasses as their colour and style can be easily accommodated by the host through matching the set with an appropriate style and colour of the table cloth. When it comes to http://www.glamorous-glass.com/Galicjan-Poland/">housewarming gifts , glassware and glass homes décor pieces will surely be a winner at the housewarming party. Wedding centerpieces provide a focal point to your wedding reception table and increasingly, they are doubling as gifts for a lucky table guest. Deciding on the perfect wedding centerpiece is often a design challenge, however, fine glass art is an incredible choice. The best thing is that glass art works come in a variety of shapes, sizes, colors and functions. When it comes to centerpieces, an upscale wedding is truly complete with fine glass art pieces originally crafted for your event that will also translate well as a home decor piece. Imagine a gorgeous glass vase as your wedding centerpiece in fine glass art. The beaty of these means little or no flowers need be incorporated. Often they can stand alone or be highlighted with simple accents. Fill them with confetti (smaller ones) or surround them with soft mini-candles! Glass bowls are wedding centerpiece ideas with endless possibilities. A new favorite is to fill them with water and place floating tea light candles or better yet, water activated diamond lights. These elegant centerpieces will translate well and fit into most home decors! Candle holders in glass art are truly unique centerpiece ideas. Bold yet warm, glass centerpieces allow you to light up each table for the ultimate focal point for the ultimate reception table setting. Sprinkle reflective confetti lightly to surround the candle holder for a shimmering effect. In each case, selecting the type of glass is important, as is the color and size. Murano glass art works come in brilliant colors and become gorgeous focal points for your reception tables. These hand blown glass pieces are more art yet maintain high function and practicality. In terms of color, anything is possible. Select a color to match or for fabulous contrast. Despite the term "white wedding", bold dark colors - including black - often make a big impact and add drama to your occasion. Bigger glass centerpieces do not necessarily mean better. What you are really going for is scale and to ensure proportion is achieved just as much as the color and shape of the glass. Many wedding planners and designers who have a knack for staging gorgeous wedding venues and spectacular table settings do just this. It's the combination of color contrast and achieving balance. Glass vases, bowls and centerpieces are often at the heart of any great wedding centerpiece and the focal point of the table - and conversation! When it comes to wedding centerpieces, highlighting glassware will surely be a winner for your wedding or special reception event. A few days ago we came back from our first trip to New York City. And we must say we fell in love with this city. So majestic and classy...at least Manhattan where we spent most of our time:) Three days in NYC resulted in painful feet. After all we were walking around for 12 hours straight three days in a row as we wanted to get as much as possible from this trip. And we did. Empire State Building, the Statue of Liberty, the New York Public Library, Broadway, Time Square...And our favourite-Central Park. We also decided to visit the Metropolitan Museum of Art (the MET) where we spent a couple of hours admiring ancient and contemporary art. We could not resist to spend a lot of time looking at ancient and medieval pieces of functional and artistic glass and ceramics. It is amazing that such fragile material like glass survived hundreds 0r even thousands of years. A number of pieces are examples of Roman and Greek art, and are dated to even the Hellenistic era. There was a lot of large footed bowls, possibly used for mixing wine, often belonging to a small group of luxury glass vessels. Some of the glass bowls represent masterpieces of glassmaking from the period when cast glass was beginning to be supplanted by vessels made using the newly invented technique of glassblowing. There was a number of pieces with engraved scenes from Greek or Roman mythology. Besides art glasswork coming from early centuries of human civilization, there are also vessels representing trends in the XIXth or early XXth centuries. One of the examples are beautiful glass vases designed by Loui Confort Tiffany. The shapes, colors, and finishes of Tiffany's vases and plaques were inspired by the natural world and by ancient glass. Here is a couple of pictures of the pieces we had a chance to admire, as well as a wonderful panorama of New York City. When you have gorgeous pieces of glass art, it is important that you make the most of their elegant beauty. Whereas they may look fantastic merely set upon a table in a corner, a piece of art really should be displayed in a manner that draws attention or ties a room together in a creative, innovative way. There are endless ways to display glass art-- and how it is displayed will ultimately depend on the shape and the type of piece it is. Here, we will suggest three ways that you can incorporate your glass art effectively into a space to make a statement that is strong, but elegant. The entrance into a space is incredibly important, as it serves as the first impression of your home. For this reason, it is the perfect opportunity to display a beautiful piece of glass art. This is particularly important if you have a uniquely shaped piece. If you have a simpler piece, it is still incredibly effective. There is so much that you can do with the piece beyond setting it on a table, however. Glass vases with one long, poetic branch of flowers will create a bit of drama, adorned with some natural pieces-- such as smooth stones or shells. Think of your entryway accent table as a sort of shrine if necessary to visualize. You can make it incredibly ornate, or incredibly simple, as long as it is a statement of your home, and how you would like your guests to feel within the space. Though perhaps not the most creative of these tips, displaying a glass art piece in its own case is a great way to draw attention to its beauty. Gorgeous hand blown glass vases and Murano pieces are perfect examples. In this case, your art becomes a main focal point of the space-- and is great for intricate, unique, or colorful pieces. Display cases come in all shapes, sizes, and materials. You can find them in furniture stores, or you could even purchase one used. A white interior with soft lighting is great for colorful pieces. If you have a larger, multi-tiered case, you can display multiple pieces of glass art. Larger pieces, however, can make a bold statement all alone. No matter what type, shape, or color of glass art you own, it is important that you show it off! From glass vases, bowls, candle holders and dishes - glass is highly versatile and can be worked into any style of decor-- you just have to know how to display it right! When it's your big day, you want absolutely everything to be perfect. We spend hours, weeks, months planning the wedding of our dreams-looking at every minute detail to be sure that all is exactly as it should be. The last thing you want at your celebration, then, is anything that can be considered generic or unimaginative. Unique, gorgeous centerpieces are a great way to personalize your reception and you don't even have to be crafty or creative to do so! Artistic glass bowls and vases are versatile, and beautiful in their simplicity. Here are a few tips for incorporating these pieces of art into your wedding reception décor. 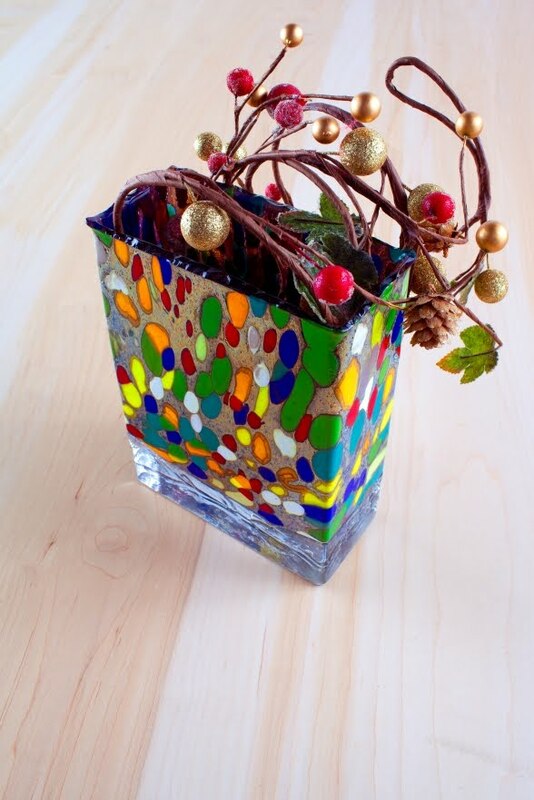 A glass bowl can of course look good all on its own, but to make it more festive, decorative, and to add a bit of color it's often a good idea to fill it with something or other. 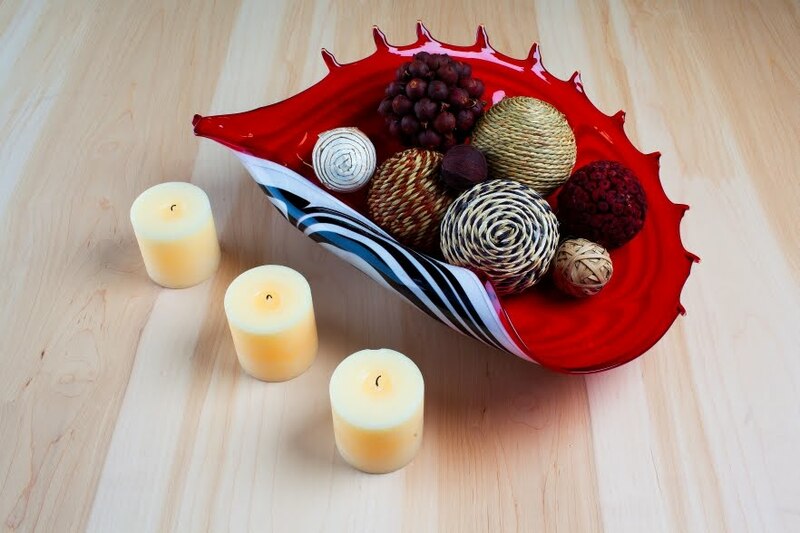 There are many routes you can take when filling a glass bowl to create a beautiful centerpiece. One option is to use the same flowers that were featured in the wedding ceremony itself. This ties the reception decor to the ambiance of the ceremony easily, and creates cohesion between both parts of your celebration. Play with arrangement of the flower within the bowl, or if you have larger flowers, consider filling the bowls with water and floating the flowers. 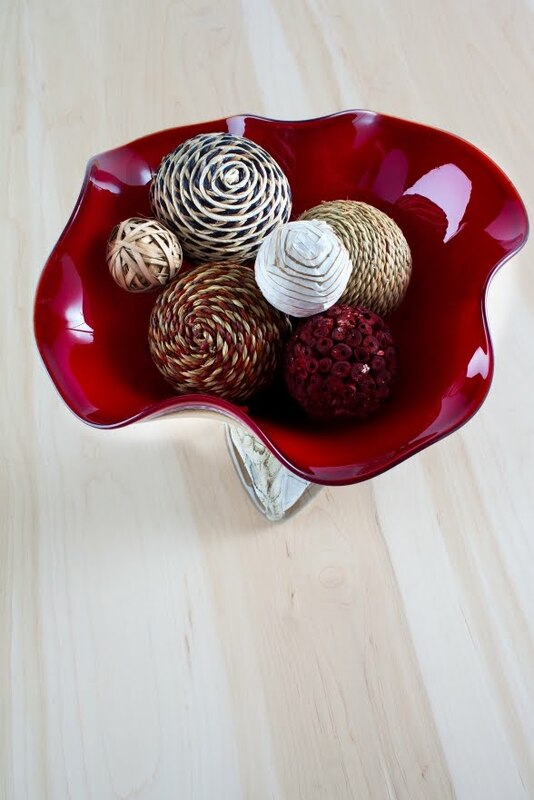 Adorn the bowl with ribbon, or surround it with candles to add a bit of oomph. Remember that there is beauty in simplicity, however, and sometimes less is more. Be aware of your decor and what works. At first glance, jellybeans may seem like a rather unusual choice for wedding reception centerpieces, but given the vast array of gorgeous colors that are available, they can be quite elegant. Finding a unique, transparent glass bowl is a great first step. You can either fill it completely with one color of jellybean, or layer multiple coordinated colors within the bowl to make it a bit more interesting. Play around and have fun! Once the jellybeans are layered and in place, you can arrange a few branches or flowers within the bowl as well. Be sure to get creative with this one - there's nothing more fun than playing with jellybeans! Using objects that you can find in nature is a great way to elegantly accent a glass bowl centerpiece without spending a whole lot of money-- and it is an easy way to coordinate your wedding decor with the season, as well! Consider filling a unique glass bowl with earth moss, cool rocks in neutral colors, or perhaps shells. 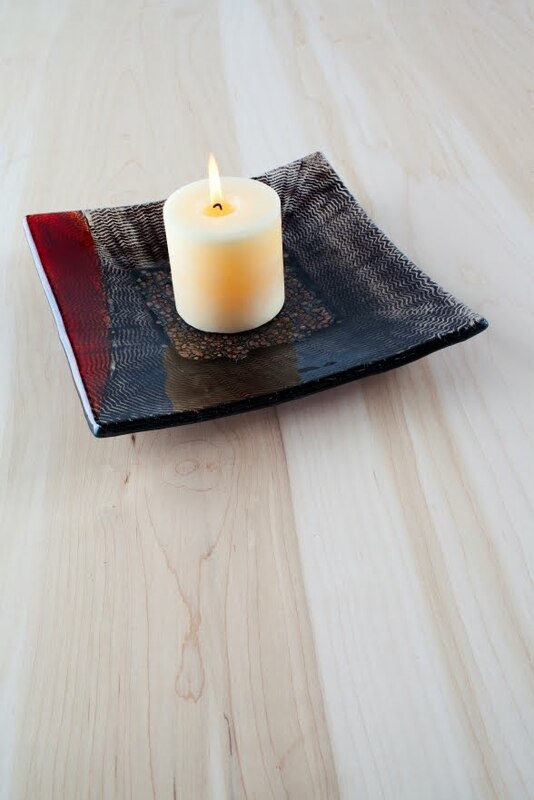 Pair these natural pieces with ribbon or rhinestones to create an interesting contrast that has a lot of visual appeal-- or find a bit of Zen at each table by setting the glass bowl on a bamboo or papyrus sheet. Coordinate each centerpiece to the place settings, treating it as a cohesive unit. The wonderful thing about your storybook wedding is that you get to write it-- down to every minute detail. Allow your creativity to flow through gorgeous glass bowl centerpieces. There is so much possibility, after all! Justyna and Artur have been fascinated with the beauty of glass and ceramic products for years. Over the years, during their travels across Europe, they have visited a number of glass works (Poland) and glass artists’ studios (Italy, Czech Republic) where they acquired knowledge about characteristics of glass and processes of making decorative glass products, like vases, centerpieces, or bowls. What is more, they gathered numerous products, from a variety of countries, including: Czech, Egypt, Greece, Italy and Poland. The collection and knowledge of glass and ceramic products has become a passion for both Justyna and Artur.